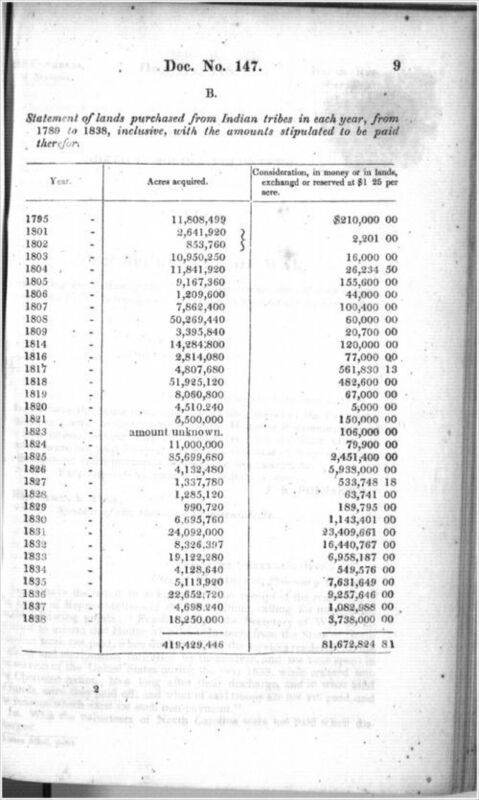 This chart outlining Indian land cessions is composed of three columns containing the year of cession, acres acquired, and the amounts to be paid for these lands. According to the bottom of the chart, the total acres acquired by the United States totaled 419,429,446 and the total cost was $81,672,824.81. The chart covers the period between 1795 and 1838. It was published in the U.S. serial set as part of series 347, document 147, titled "Indians Removed to West Mississippi from 1789." This easy-to-understand chart can be used in the classroom to talk about how the Indian Removal Act was only a continuation of the United States' policy toward native groups. It could also be included in lessons about the motivations behind removal. Students can also compare the numbers of acres to the price paid for those acres in any given year. Call Number: U.S. Congress. House of Representatives. The Executive Documents. 25th Cong., 3d. sess., vol. IV, 1838-1839. House Doc. 147. Serial 347.